Abdulmohsen Abdulaziz Al-Babtain Co, the sole authorised dealer of Nissan in Kuwait, recently launched the new 2018 Nissan Pathfinder in the country. The Nissan Pathfinder is reborn for the 2018 model year with more adventure capability, a freshened exterior look and enhanced safety and technology, the company said. The latest iteration of this popular, family-oriented four-wheel drive vehicle draws on Nissan’s vast experience of building vehicles designed to operate in testing off-road conditions while remaining perfectly at home on the highway. As an SUV vehicle, the Pathfinder retains plenty of capability in off-road environments. 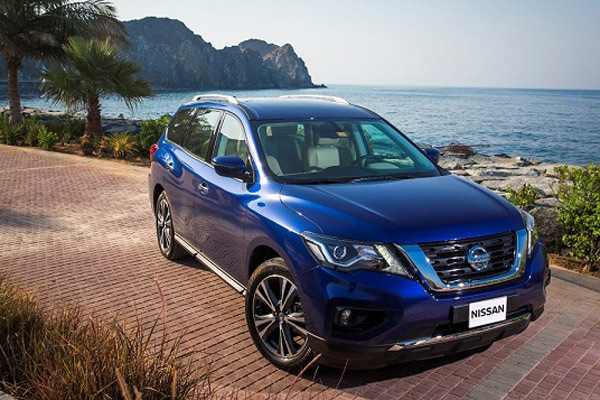 The refreshed Pathfinder benefits from changes both externally and internally. The revised 3.5-litre V6 engine has more horse power and more torque. The seven-seat vehicle offers enhanced driving dynamics such as more controlled ride and handling, less vibrations on turns and easier manoeuvring. This is due to many enhancements such as smaller strokes, less under-steer, improved roll balance and improved steering ratio. The 2018 Pathfinder is offered in 2-wheel drive configurations and a choice of two well-equipped grade levels: S & SV. Externally, Pathfinder now aligns more closely with Nissan’s latest design language thanks to signature elements, including the new “V-Motion” grille and striking boomerang-shaped headlights with LED daytime running lights. Other new styling elements include a redesigned front bumper, fog lights, wing mirrors with integrated indicators and new 18-inch and 20-inch aluminium-alloy wheel designs. The rear taillight cluster and rear bumper have also been refreshed. In terms of practicality, a Motion-Activated liftgate comes as standard on SV. On sweeping a foot under the tailgate, it opens automatically and stops at the desired point, the company said. Inside, the revamped Pathfinder offers stylish, comfortable seating for seven occupants who benefit from a variety of updated connectivity features. The latest Pathfinder adopts new-generation information technology with an Advanced Drive-Assist Display located in the centre of the instrument binnacle providing supplementary infotainment and driver assistance displays compared to the previous model. Options such as Intelligent Emergency Breaking, Intelligent Cruise Control, Blind Spot Warning (BSW), Forward Collision Warning and Rear Cross Traffic Alert (RCTA) are available on the SV. In a major step up of its already highly capable adventure credentials, Pathfinder’s new 3.5- liter V6 engine features more power and torque. It utilizes more than 50 percent new or new-to-Pathfinder engine parts and components – including combustion chamber design, pistons, intake manifold and e-VTC (fully electronic on intake).